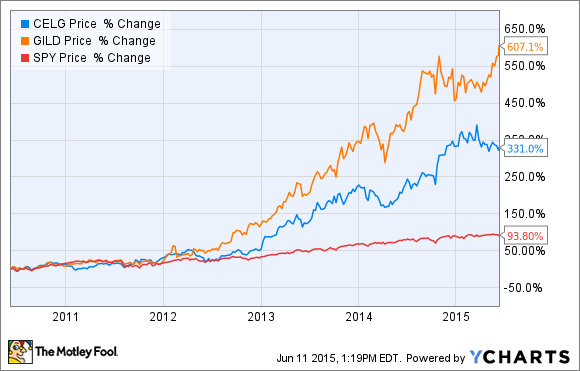 Better Buy: Gilead Sciences Inc. or Celgene Corporation? 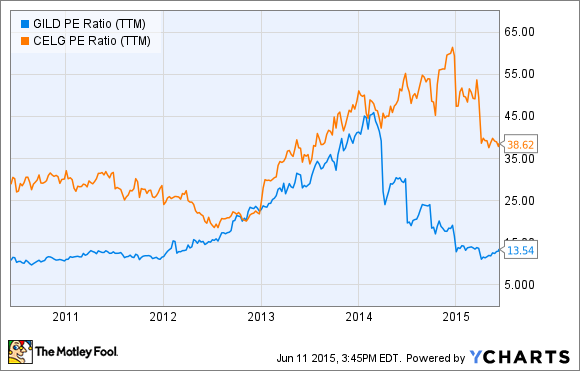 Celgene and Gilead have been great stocks to own over the past few years. Which one is a better buy at today's prices? Large-cap biotech companies Gilead Sciences (NASDAQ:GILD) and Celgene Corporation (NASDAQ:CELG) have made fortunes for their long-term investors. Both companies are riding high after producing great revenue and profit growth, and their stocks have smashed the returns of the S&P 500 over the past five years. Gilead has been the clear winner in recent years: Despite Celgene's excellent performance, Gilead's returns have simply been stunning, as the stock has been better than a five-bagger since 2010. Of course, we should never invest based just on what happened in the past; the future performance of these companies should be what interests investors. Which company is more deserving of your investment dollar from here? Celgene has been able to put up huge revenue and profit growth in recent years, thanks primarily to the massive success of Revlimid, a drug that treats multiple myeloma, a type of blood cancer. Through a combination of Revlimid's success and the strong growth of other cancer-treatment drugs such as Abraxane and Pomalyst (called Imnovid in Europe), Celgene has managed to grow revenue by 20% annually for the past five years. Better yet, that strong revenue growth has been met with increasing margins and a strong share repurchase program, which has catapulted earnings per share at a 27% rate over that same time period. It doesn't look as if Revlimid's growth is going to slow anytime soon, either, as the company has several clinical trials under way that could continue to expand the labeling for the drug. If Celgene can find more clinical indications for Revlimid and get them approved, a strategy that has been the hallmark of the company, the drug should continue to grow its sales for years to come. Patent expiration doesn't look like too much of a problem, either, as Revlimid is covered until 2027 in the United States and at least until 2022 in Europe. On the downside, Celgene's future is tied directly to the success of Revlimid, as the drug was responsible for 64% of Celgene's 2014 revenue. That means that if the drug were ever recalled, if a better treatment option were to come along and displace Revlimid, or if a competitor were able to successfully challenge the drug's patent, Celgene investors would be in trouble. Looking ahead, analysts see profits continuing to grow strongly, with estimates showing a 25% annual increase for the next five years. If Celgene can hit those targets, there's no reason the stock can't continue its march upward and reward shareholders for years to come. Gilead made a name for itself as the dominant player in treatment options for the HIV market, which is a position the company still holds thanks to the success of blockbuster drugs such as Atripla and Truvada. However, in the past year Gilead has become a Hepatitis C powerhouse as well, as newly introduced drugs Sovaldi and Harvoni more than doubled Gilead's revenue year over year. Gilead boasts a pipeline full of opportunity as well, as it has eight new drugs in phase 3 clinical trials, including several designed to address diseases in the cardiovascular and hematology/oncology markets, which are new to the company. Gilead is also attempting to extend its leadership in the HIV/AIDS market, as it has two drugs pending with the FDA. On the downside, Gilead may see some pressure for its new blockbuster drugs Sovaldi and Harvoni from competitor AbbVie. AbbVie has gotten aggressive with its own hepatitis C treatment, Viekira Pak, and has tried to undercut Gilead's pricing. AbbVie was successful in securing an exclusivity deal with pharmacy benefit manager Express Scripts to drive sales. This development is something Gilead investors need to watch closely. Despite that negative, analysts see the good times continuing in the years to come, as they expect Gilead to grow profits by 13% annually over the next 5 years. Gilead's monster revenue growth has caused its earnings multiple to collapse recently, as it currently sits at a P/E of under 14. By comparison, Celgene can hardly be called cheap, as the company is currently trading at more than 38 times trailing earnings. While I think either company could make for a great investment at today's prices, I'm more inclined to give Gilead the nod right now. Although the near-term revenue growth for Celgene looks quite strong, Gilead has a more balanced revenue profile, as it isn't quite as reliant on the success of one drug as Celgene is. In addition, the company recently initiated a massive capital-return program that includes paying a small dividend and buying back up to $15 billion worth of stock. When you combine those attributes with the company's smaller price-to-earnings multiple, I think the near-term returns for Gilead may continue to edge out Celgene's, which is why my money is on Gilead.